Summary: The prospects for a rapid breakdown in the Brexit negotiations are worrying. Well organised groups that want them to fail and fail quickly are in the ascendancy. Downing Street is struggling to contain internal squabbles and the inevitable difficulty of the negotiations is likely to accelerate that breakdown. The conditions will be perfect for a far right takeover in the absence of any serious coordination amongst Remainers, and a total absence of an opposition party. The triggering of Article 50 will start Brexit negotiations with our European partners. Most commentators, both Leave and Remain, think that reaching an agreement will be very hard particularly within the official two-year period. Despite Theresa May wanting to keep everything under her hat, we know that European negotiations leak information brilliantly so we will get a pretty good idea how things are going quickly. We can expect reaction within the UK to those rumours immediately. We can predict that two major stumbling blocks will emerge quickly. These are the size of the payment to the EU on departure, and the linkage of access to the single market with a degree of freedom of movement for EU citizens. A lot of people don’t want these negotiations to work at all and want the UK simply to walk away from the EU. What must be recognised and taken very seriously is the existence of a well- coordinated group that calls itself the European Research Group, although Extreme Right Group would be a much better description of the ERG. A worrying piece in The Times in mid-February about the ERG may be found at: http://tinyurl.com/h2jz64d. That piece describes the activities of a group of nearly 60 MPs working hard to ensure that the only Brexit is a full, hard Brexit with the UK leaving the EU without any agreement. The group is understood to be led by Steve Baker, MP for High Wycombe although his rather out of date webpage makes no mention of this activity. The ERG do not want to pay anything to the EU on departure and are adamantly opposed to any single market arrangement that might allow a degree of freedom of movement for EU nationals. The group appears to be highly disciplined and highly coordinated, focusing their efforts on agreed targets in a carefully managed way. They have already been able to organise effective attacks on a number of important individuals apparently opposing Brexit. The Remain side at present has virtually no comparable organisation or coordination and therefore the attacks from the ERG go virtually unopposed. 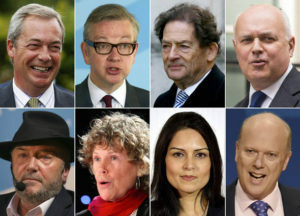 Many of the members of the ERG are indeed on the hard right and were previously thought of as the troublemakers/headbangers that consistently made the life of Conservative Prime Ministers difficult. Downing Street is already in a state of some turmoil at least in part because of the OmNICshambles budget, and the extent to which the Treasury is effectively blocking many of Theresa May’s policies that would ease pressure on the poor and just about managing groups. Austerity continues to roll along undiminished. The effectiveness of the ERG gives them a disproportionate power, forcing Theresa May to accommodate their views and approaches to Brexit to a degree she would not perhaps otherwise wish. Once Brexit negotiations start, it will become clear rather quickly that there are two major stumbling blocks almost impossible to circumvent. These are firstly the size of the the departure payment (the ERG want us to walk away and pay nothing, something almost impossible for the EU to agree) and secondly that access to the single market will require a substantial degree of freedom of travel for EU citizens, something that again the ERG are dead against. These sticking points will become clear quickly and that is when we should expect the ERG to push for the UK to scrub the negotiations and simply leave the EU without any agreement. Theresa May in her position of being weaker in Westminster because of internal squabbles in Downing Street may find her position as Prime Minister threatened. The ERG would begin to pressure her to accept a hard Brexit or resign as PM and quite likely trigger a general election. From the ERG’s point of view, the sooner this is done the better. The longer the negotiations drag on the more likely the negative effect on the economy of the continuing uncertainties will become obvious. If that is allowed to go on popular opinion may well swing against Brexit, particularly if it is to be a hard Brexit. The ERG cannot afford to risk delaying till that happens. At that point the takeover of the UK by the extreme right in Parliament would be complete. Labour, of course, have no part in this, apparently little interest in it and certainly would not be in a position to fight a general election with any plausible chance of success. Even brilliantly organised parties cannot overturn a position of being 18 or 19 points down on the government in a relatively short time.